Hi Helen and Barry here, welcome. ‘Our’ little farm and camping site is privileged enough to be located right on the starting section of the Pembrokeshire National Coast Path Walk, with our farm entrance being ‘Gate Number 1!’ with gate 2 on our farms doorstep. We overlook the mouth of the river Teifi estuary as it meets the Irish Sea in Cardigan Bay. 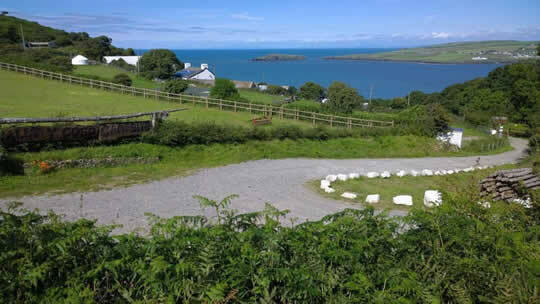 Our camp site also looks out towards Cardigan Island and the Cliff Hotel. The distinctive peak of Mwnt beach is visible just beyond - its a beautiful place that we want to share with you beit walkers coming through or campers that decide to stay. Our fully licensed camping area is situated just behind the farmhouse and outbuildings, with our frontal view looking out towards the rising sun in the morning. The coast path itself goes through our front garden and up onto the nature reserve on Cameas headland. We would like to extend a welcome to any of you campers, from the single traveller who wants a one night stay to families or groups of friends wanting to stay a week or so. Please take a look at our Camping Prices or Yurt Prices for more information.